The Cheshire Cat's colorful personality in Disney's Alice in Wonderland is a perfect match for this Brazilian artist's energetic pop-art style. 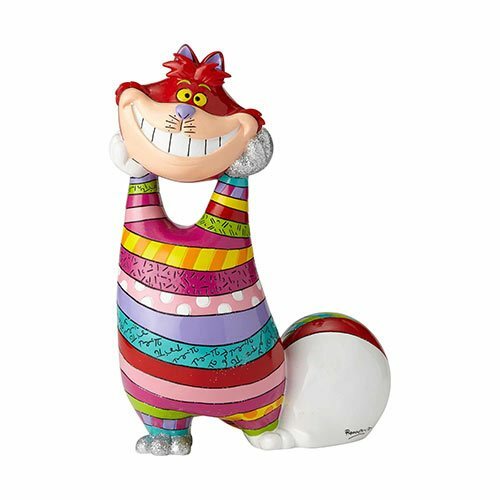 Big, bold, and unabashedly optimistic, this handcrafted Disney Alice in Wonderland Cheshire Cat 14 1/4-Inch Statue by Romero Britto will spark both conversations and imaginations. The 14 1/4-inch tall glossy design is intricately sculpted from stone resin and hand painted by a team of skilled artisans. It will brighten the day of any Disney fan fortunate enough to own it.